First of all, I wanted to back up a bit and discuss the grout. 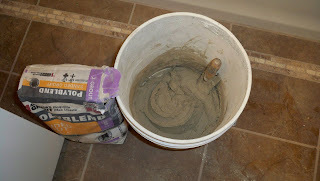 We used 1 1/2 bags of grout. We had less, which of course led to an emergency run to HD mid-day. One of the tricks I'd been told over and over again was to not do the grout over two different days. You're supposed to grout everything in one sitting because it's just too hard to feather wet grout into dry grout, and it makes for a weak spot in the seal. Secondly, to avoid getting grout all over the white paint around the surround, I used blue painter's tape to protect the walls. This worked out great, except for the top back wall of the tub where the grout sealed in the tape. 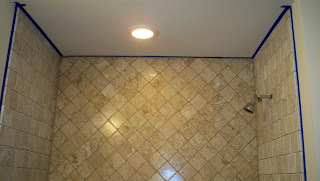 I had to use tweezers to pull out the tape the next day after the grout dried. Since I can barely reach the top of the tub as is, that was a real pain in the @ss. I guess I'd recommend pulling the tape while the grout was still semi-damp. I mixed the grout until it was a peanut-butter texture and rubbed the grout into the joints. This was hard work, and really rough on the hands. I highly recommend the use of gloves. Any gloves. The grout dried out my skin afterwards and needed some serious moisturizing to prevent cracking. 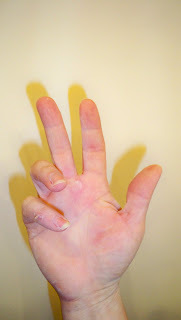 The big blister between the middle and pointer fingers didn't help much either. Nor the scrapes on my knuckles. This one was rough on the hands. Once the grout was in, it needed wiping down with a soft wet sponge. Many many times. After six or seven wipedowns, I still needed more. 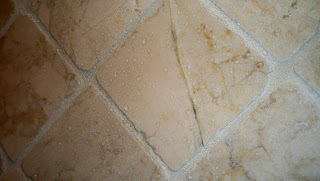 As soon as the water would dry on the face of the tiles, I'd begin to see haze. Time for another sponge bath! After ten times, carefully cleaning the sponge after EACH pass, I was satisfied it was done enough and let it dry for 3 days before starting to seal it. But now the sealing process is over. Yes, it is finally done. The first application I started off very carefully dipping the brush into the grout sealer (a clear thin liquid sealer) and applying first to the grout until it was soaked in and changed the color darker. Then I went back and made sure the tiles were covered over. I focused on two rows at a time, making sure I had complete coverage before moving on to the next lower rows. Once the first coat was on, the instructions said to wipe off any excess. There wasn't any. Those tiles are like little sponges. VERY IMPORTANT NOTE: When using travertine marble (I'm not sure about other types, but this warning came in clear from the king of coasters himself about these.) DO NOT USE RED MAGIC MARKERS ON THE BACKS. Black markers are apparently ok, but the red ones.... the red ink WILL seep through. He said he had to redo an entire installation a month after installment because they used red markers on the back to assemble a layout, and lo and behold.... the porous nature of the marble brought that red ink right on through to the front. Not good. So anyway, after the first coat, I decided to wait a day. When I came back to it, everything was dry and pale again. So the sealer really didn't darken the tile or the grout permanently. Not even for a day. The second application went a lot quicker. Mainly because I gave up the plastic container and poured the rest of the sealant into a spray bottle and went to town. Muuuch quicker. Still, I had drips, but I was able to catch them easily with the paint brush. I think I may have used more sealer than I did on the first run, but that's ok. Still, after 20 minutes on the second coat, there wasn't much excess to wipe off, so I took an old T-shirt and wiped the tiles down well. btw: Just a tid-bit of a suggestion to those who will be building their own bathtub area from scratch... not just tiling it, but building it. They do come hand-in-hand, especially if you're the one who is going to be tiling/painting/whatever: Don't make the surround any taller than you can reach diagonally while standing on the outside rim of your tub. I am 5'5" and I almost couldn't reach the corners of my tub for mastic, grout or sealant. I DID NOT pay attention to my reach when planning out the height of the tub. If you're doing a project like this alone, you should seriously take the height of the shower into consideration. Me? I just got lucky. I almost slipped a couple of times and had some sore arms trying to position a 3-1/2" triangle of marble tile on the mastic perfectly at the top of the tub, but I would do it differently (3-4" lower) if I had to do it over again. After I'd given the second coat of sealant a good 12 hours to soak, it was time to caulk. I used white silicone caulk all around the top (Ugh... another pain in the arse getting it smoothed out while 'on point' at the edge of the tub rim... can you say 'leg cramp'?) and the bottom and a small run on the outsides as it edged up to the painted wall. Side note: on our upstairs tub we've already noticed some moisture on the wall next to the sides of the tub enclosure. It's getting that 'moisture wrinkle' from long hot showers. We'll be painting that area (as well as in the master bath, learning from the mistakes of the other tub) a water-resistant semi-gloss ASAP. After caulking on the shower head flange and the water flow knob... I took the new shower-massage-adjustable-head for a spin and doused the opposite wall down with water. The water beaded up perfectly. Yeah! I wish I had thought of using painters tape when we grouted our bathroom -- I'm still looking at grout stains that need to be painted over! 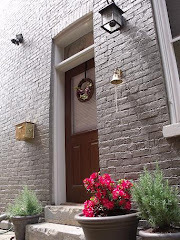 Great blog -- I'm enjoying reading 'bout your renovation exploits! Just for future reference, a piece of plywood cut as a rectangle to fit the top of the tub, with a 2x4 or other scrap screwed to the underside just inside the outer tub edge (to keep the plywood from sliding out of the tub surround) will give you plenty of room to work, and a place to (somewhat) safely put a ladder. It also prevents dropped tiles from scratching the tub. We learned this from professionals before trying it in our own tub surround tiling job. 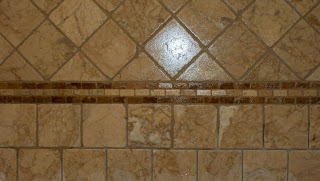 Wonderful blog and beautiful tile job! You guys mentioned you got most of your tile for free or at a severe discount from a family member? What might be a good price for the same type of tile when purchased elsewhere? My wife and I are about to start purchasing the same stuff for a tile backsplash in the kitchen. Hi, Tom. Yes, we got all of our tile from a relative (Mark Schmidt owner of StudioVertu.com). The tile we used is actually tumbled Italian Botticino marble, and generally a higher quality than what you can pick up at Home Depot, but they carry a similar looking tile for about $1 per tile, I think. We looked at them to try to match a color, but were not too successful at matching. Good luck, and remember whatever you go with, pull your tiles from several different boxes when installing. It makes a BIG difference. Awesome... thanks for the info! The shower looks great, BTW! I just wish I could have been more helpful ;-) One thing to remember as well, if you're buying a tile from a Home Depot store (this is gonna sound weird) but take a few of the tiles to the bathroom before you buy them and wet them down. Often the tiles are still covered with a lot of marble dust and they don't reflect the outcome of cleaning and sealant very well.